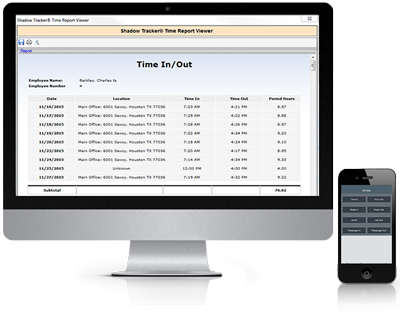 Shadow Tracker® Time software is the perfect solution for time sheet management of mobile and office employees. Mobile employees, such as drivers, can time in and out on the Shadow Tracker® Time Android or iPhone Apps, and their location at the time punch is recorded for verification. For office employees, ATTI offers an in-office time tracking system which works in a LAN or Wi-Fi configuration. This component is optional, and integrates office employee time records with those recorded on the Shadow Tracker® Time App so your time sheets are housed in one convenient location. ATTI’s mobile time tracking device allows for added security and verification when monitoring your employees. 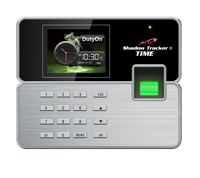 The Shadow Tracker® Live gives business owners the opportunity verify GPS locations of remote time punches. In addition, the biometric keypad device has three punch options: keypad, fingerprint, or RDIF Card. Using a GPS verified mobile time punching system benefits business owners by eliminating employee time theft, discouraging poor attendance habits, and therefore reducing labor costs. Our mobile app also gives you access to your employees’ reports at all times.